Inventory We are a resale marketplace, not a box office or venue. Ticket prices may exceed face value. This site is not owned by Cajundome . 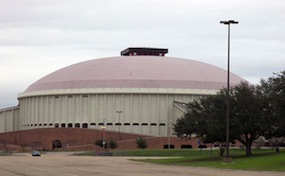 The Lafayette Cajundome opened in 1985 as home to Louisiana's Ragin' Cajuns men's and women's NCAA basketball teams. The Cajundome box office is located at 444 Cajundome Boulevard in downton Lafayette, Louisiana. The arena has a maximum seating capacity of 13,500 and was built for a total construction cost of $60 million. Cajundome tickets have included concerts like Keith Urban, George Strait, Kiss, Elton John, and Reba McEntire. The Lafayette Cajundome also hosts many other traveling shows like the WWE, Disney On Ice, and Cirque Du Soleil. The arena is most known for the Cajun Heartland State Fair that is an eleven-day event that generally brings in more than 175,000 visitors. After the devastating aftermath of Hurricane Katrina in 2005, the Cajundome was used as a shelter for the masses. It was a key evacuee point when Louisiana was struck by Hurricane Rita soon after and was already staffed by The Red Cross, Salvation Army, Americorp, and a slew of local charities. The facility was a relief center for the thousands throughout the horrific ordeal. The newly opened convention center houses a Special Needs Clinic that serves those in need of additional care not categorized as emergency or urgent. Cajundome.ArenaLafayette.com is not affiliated with any primary venue, supplier, box office, or official site. We are an independently owned and operated company that concentrates in all online sales in the secondary ticket market. Prices online may be below or above face value and can change quickly with market conditions. To order tickets for all Cajundome Lafayette events simply follow the steps online through checkout or pick up the phone and call our operators at anytime.